Dublin International (YHA) kohteessa Dublin, Irlanti: Varaa nyt! Dublin International Youth Hostel is located on the North Side of the Liffey river, just a 5 minute stroll from O’Connell Street and 10 minutes from the GPO and the Spire in the centre of the city. 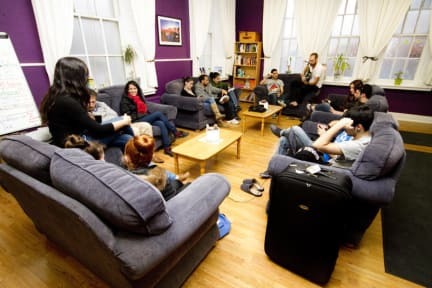 The Dublin International Youth Hostel was originally a Girls’ Convent School for the local area and has been adapted to now accommodate the many world travellers of today. It still retains many features of its previous use, with the statues of Saint Joseph and Jesus to the bright refurbished Church that serves up the free light breakfast each morning instead of a sermon. Some of the hostel bedrooms were once home to the Nuns of the Sisters of Charity order, as well as being classrooms for some of the girls of the area, one of whom was the sister of James Joyce. As the only hostel in Dublin connected to An Oige – Irish Youth Hostel Association/Hostelling International and YHA, the hostel lives by the ethos of both providing affordable and safe accommodation for people to experience Ireland and its culture, as well as being committed to sustainability and recycling practices to lessen our impact on our environment. Good breakfast, free and all. Overall a good hostel - tidy, the location is pretty good, and the continental breakfast was tasty. I subtracted security points for the fact that the lockers in the rooms did not have locks - they require a separate padlock, which is not mentioned on the hostel website. Also, in the age of smartphones, one power socket in a room of 8 people is not enough.